Coffeemakers are cooking appliances used to brew coffee without having to boil water in a separate container. While there are many different types of coffeemakers using a number of different brewing principles, in the most common devices, coffee grounds are placed in a paper or metal filter inside a funnel, which is set over a glass or ceramic coffee pot. Cold water is poured into a separate chamber, which is then heated up to the boiling point, and directed into the funnel. This is also called automatic drip-brew. Since their invention in 1901, multiple machine designs have been created to produce espresso. Several machines share some common elements. to include milk, for beverages such as the cappuccino and latte. A steam-driven unit operates by forcing water through the coffee by using steam or steam pressure. The first espresso machines were steam types, produced when a common boiler was piped to four group heads so that multiple types of coffee could be made at the same time. The design is still used today in low-cost consumer machines, as it does not need to contain moving parts. Many low-cost steam-driven units are sold in combination with a drip-coffee machine. There are two types of lever machines; manual piston and spring piston design. With the manual piston, the operator directly pushes the water through the grounds. In the spring piston design, the operator works to tension a spring, which then delivers the pressure for the espresso (usually 8 to 10 bar). A refinement of the piston machine is the pump-driven machine, which was introduced in the Faema E61 in 1961, and has become the most popular design in commercial espresso bars. Instead of using manual force, a motor-driven pump provides the force necessary for espresso brewing. Commercial or some high-end home machines are often attached directly to the plumbing of the site; lower-end home machines have built-in water reservoirs. Some home pump espresso machines use a single chamber both to heat water to brewing temperature and to boil water for steaming milk. Since the temperature for brewing is less than the temperature for creating steam the machine requires time to make the transition from one mode to the other. Some machines use a single boiler kept at steaming temperature, but water for brewing is passed through a heat exchanger, taking some heat from the steam without rising to the same temperature. This is found in many mid-range machines. There is some controversy as to the temperature stability of the brewing water, since it is indirectly converted from steaming temperature to brewing temperature, rather than kept at a brewing temperature. The term "Dual Boiler" is used narrowly for machines with two separate boilers, and more broadly for what are more properly called Dual Heater (DH) machines, featuring a boiler for brewing and a separate thermoblock (TB) for heating brew water to steaming temperature – opposite to HX machines, where the boiler is at steaming temperature and is cooled to brewing temperature. In principle, TB machines yield stabler brew temperatures at the expense of steaming performance and speed, while HX machines yield better steaming at the expense of stable brew temperature. True DB machines provide stable brew temperatures and fast steaming, but are larger and more expensive. In recent years air-pump driven espresso machines have emerged. These machines use compressed air to force the hot water through the coffee grounds. The hot water is typically added from a kettle or a thermo flask. The compressed air comes from either a hand-pump, N20 or CO2 cartridges or an electric compressor. One of the advantages of the air-pump driven machines is that they are much smaller and lighter than electric machines. They are often handheld and portable. The first air-pump driven machine was Handpresso Wild, which was invented by Nielsen Innovation SARL, a French innovation house, and introduced in 2007. Semi-automatic use a pump rather than manual force to deliver water. The remaining brew pressure in the basket is released via a three-way valve. Automatic machines also automate the brewed volume (hence indirectly brew time). They do this by adding an in-line flowmeter to the grouphead: when the programmed amount of water has passed through the meter, the pump turns off. Grinding and tamping are still manual. 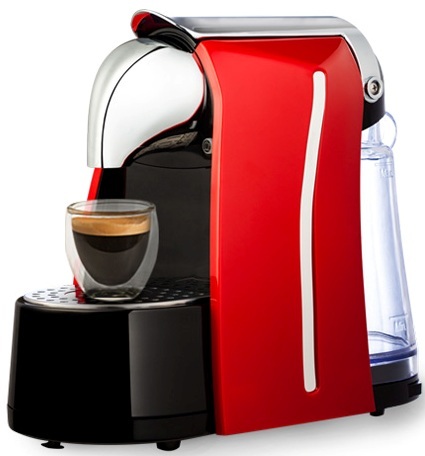 Super-automatic machines automatically grind the coffee, tamp it, and extract the espresso shot. The operator only has to fill the bean hopper and, if the machine is not connected to a water line, add water to a reservoir. Some models contain an automated milk frothing and dispensing device. Super-automatic machines take away the ability to manually tamp and grind the coffee, which may affect the quality of the espresso. Manual or semi-automatic machines offer more control of shot quality. Because when to cut the shot (brew time) is a critical variable, which is often adjusted shot-by-shot, semi-automatic machines are often preferred over automatics, though some high-quality machines are automatic.anual machines are more popular in Europe, where it is more common to drink straight espresso. Most super-automatic machines cannot handle a high volume and require more maintenance, making them unpopular in commercial applications. They produce very little counter mess, though, and are more compact than a machine with a separate grinder. Super-automatic machines are generally considered to produce inferior quality to a trained barista, but superior quality to an incompetent barista, and greater consistency. Further, super-automatic machines require less skilled, indeed virtually unskilled operators, which cuts expenses on worker training, which is a significant concern in environments with high staff turn-over.